Convenience, exclusive savings, opportunities to check your accounts regularly. Don’t miss out on the exclusive privileges Optimum BusinessWorld credit card has to offer your company! Use Optimum BusinessWorld credit card securely to pay for all your business spending and transactions anywhere in the world, removing the need to carry cash or a cheque book. On all of your business trips, whether home or abroad, you can pay for accommodation, travel, office equipment and any other work-related purchases rapidly and very easily using BusinessWorld card. What’s more, using BusinessWorld card earns you Optimum Points for all your purchases worldwide. You earn even more Optimum Points when you pay in instalments or make one-off payments at establishments which accept BusinessWorld. You can spend the points you have earned immediately, or use them to make free purchases later at Optimum POS member merchants. Authorised personnel can access company accounts, make payments and withdraw cash instantly at our branches or from ATMs. If abroad, cardholders can withdraw instant cash at ATMs displaying the MasterCard/Visa logo. 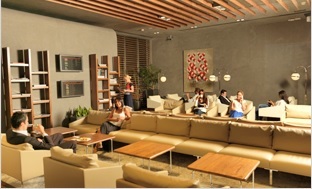 You can benefit from the Comfort Lounge services at Istanbul Atatürk Airport foreign terminal free of charge. If you are a member of Corporate Internet Banking, you can use our Internet branch to check your Optimum BusinessWorld account summary and balance keep track of all its movements and check the status of every card issued to you or your company. You can also check all expenditure made on each card in detail, on an itemised statement issued to your company name. In this way you can easily keep track of all company expenditure. With your BusinessWorld card you can take advantage of all the lounge area services free of charge. While having your free drinks and waiting in the elegant Comfort Lounge, you can browse the Internet to spend your free time or to conduct your business affairs. You can relax with a shower or enjoy a massage chair. What’s more, you can also entertain a guest for free. Let your children take advantage of the exclusive services of the Comfort Lounge too. There's a 50% reduction for those aged 7-12 and it's free for the under 6 ages. To take advantage of the Comfort Lounge services, you must have used your card within the last three months and have made regular payments. ATU Lounge Usage Rules Changes: As of June 1, 2016 Ataturk Airport Comfort Lounge conditions of use have been changed. For free use of the Comfort Lounge, the total expenditure in the last statement or current term activity for the main card and/or additional card should be 1500 TL. For the cardholder and one guest together (2 people), the expended total amount of 2,000 TL will be asked for free use in addition to the existing conditions. Personal accident insurance provides cover of up to 50,000 TL in the event of death or permanent injury resulting from an accident. With your Optimum BusinessWorld card you can take advantage of free workplace merchandise insurance. You can insure all goods at your workplace against fire and flooding. With a warranty of 50,000 TL, free for a full year, this buildings insurance can be renewed at a special discount price for the following year and thereafter, if you wish. You can arrange direct debits for your regular company bills and pay easily for your mobile phone, insurance and Internet services. With OptimumCard you get points with every transaction, not just when you shop. Pay by direct debit or use your Optimum Points to pay... and get even more Optimum Points. Opportunities are limitless with OptimumCard... the Call Centre on (0392) 600 02 02, Internet Branch and KOOP24 ATMs are at your service. Check the balance and statement information on your card, make cash advance withdrawals and pay for your credit card accounts by accessing the current and cheque accounts linked to your card at our KOOP24plus+ ATMs which also accept cash payments. OptimumCard thinks of your relatives... It offers special opportunities with additonal cards designed for them. You can choose extra cards and specify the limit of these cards yourself either for your spouse or other members of your family aged 18 and over. E-mail, SMS, Fax. You can ask for your statements to be sent to you via e-mail or fax. If you wish, you can have your payment information as a short message on your telephone. The details of every purchase made using your OptimumCard while abroad will be sent to you as an SMS to ensure your safety at maximum level. OptimumCard will never leave you stranded... It is insured against loss and theft. Don’t worry if your card is lost or stolen, just call us immediately. You will not be liable for any purchase made on your card from the moment you notify us. Payments are easy with OptimumCard... Your purchases can be paid easily when payments are due. With OptimumCard you have many payment options... Pay the minimum amount indicated on your statement and leave the balance on your card. Place a standing order instruction to settle either the whole balance on your statement or the minimum payment. Payments made via the Telephone Banking on (0392) 600 02 02, the Internet Branch, the Mobile Branch or using KOOP24 ATMs before 23.30 are credited on the same day. Alternatively you can pay cash direct from KOOP24plus+ATMs. Get Optimum Points with OptimumCard... Your first points are complimentary from us. 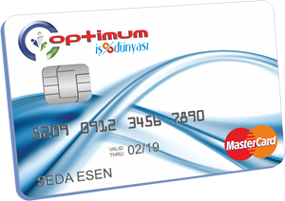 We offer you starter Optimum Points worth 5.00 TL with your new OptimumCard as a “Welcome Gift” and double that if you are a new customer whose salary is paid directly into an account with our bank or a new customer who arranges for this. Use your Optimum Points to treat yourself. Obtaining an OptimumCard is very easy... Discover how right now. All you need to do is visit your nearest KoopBank Branch and fill in an application form. Bring a photocopy of your ID, your residency certificate or an electricity or water utility bill in your name and a document indicating your income (payslip, employer's letter - if you are a pensioner or a freelancer, please indicate your income on the application form) and give them to one of our customer service staff. Those who can not provide an Income statement to get an Optimumcard , a deposite account will be blocked in order to be able to get the card. Don't forget that first OptimumPoints are complimentary. For the Optimum Business Credit Cards, company will be the cardholder. Therefore, the account statements will be under the name of the company. Cards will be issued to the person(s) appropriate by the company management. Click here for fees and rates valid on Credit cards. Don’t postpone your dreams. Choose the instalment option for your purchase payments. Use Optimum Instalment for your OptimumCard payments. You can take advantage of favourable shopping opportunities and payment conditions whenever you see the Optimum symbol in more than 4,000 outlets. With OptimumCard you have the option to either pay in full or in interest-free instalments regardless of the payment period.You get OptimumPoints from both of your instalment and full payment purchases. Shop first, pay later anywhere in the world. You can even pay off your cash purchases in instalments...! With OptimumCard you can turn all your single payment purchases into instalment payments at home or abroad. All you need to do to make your payments is visit our Internet Branch online, use our Mobile Branch via your mobile phone or tablet or contact our Call Centre on (0392) 600 02 02. Fee for a 3 instalment delayed payment is 2.63%(BSİV not included). Fee for a 12 instalment delayed payment is %9.70 (BSİV not included). Following the exchange procedure completed within the banking system, a fee of 4.88% and its BSIV is added to the TL equivalent of your purchase price. Then the “Total amount to pay” is divided by six and the resulting amount is paid in six instalments. Dial 0 on (0 392) 600 02 02 to connect to one of our customer services representative at our Call Centre. You need to request delayed instalment payment prior to the payment due date of the credit card used for your purchase. You can request delayed instalment on each of your purchases and pay for as many purchases as you like. You can also request instalment payment for the purchases made with the additional card/s. Delayed instalment payment requests for purchases made on the additional card need to be made by the main card holder. Purchases made on POSNET e-commerce are included. In order for your single payment purchases to be converted to delayed instalment payments, the purchase needs to appear as debt on your card but not to be included in your statement. Payments that are not made using Optimum POS Machines can take a few working days to appear on your card, so you can request delayed instalment after this period. For single payment purchases made using Optimum POS Machines a delayed instalment request can be made on the same day. Payments made during any special campaign offers such as delayed payment or extra instalment will not be eligible for delayed instalments. Even if your request is accepted and entered through the system, it will be cancelled. A request made for a delayed instalment can be cancelled on the same day. A new request for delayed instalment payment on a purchase can be made the next day following the cancellation of a delayed instalment request on it. Purchases made using Optimum Points are not included in this application. Cash advances, expenditure in casinos or on other forms of gambling and purchases previously divided into instalments are not included in this application. There is no refund of payments made if you wish to complete the payment of your purchase prior to the instalment period. Do not make a big deal … Simply withdraw cash advance from ATMs and our branches. ! With OptimumCard you have the freedom of a cash advance anytime you need one. You can withdraw cash from all KOOP24 ATMs, our branches and all ATMs displaying the MasterCard/Visa symbol, at home or abroad. Earn all the time… Shop for free by spending points rather than money. Optimum Points with OptimumCard. Single payments or instalments, you get Optimum Points on all purchases paid for with OptimumCard. What's more, you can double and quadruple your points at certain point levels and at certain periods. Then you can use the Optimum Points as money for shopping at various shops/businesses.